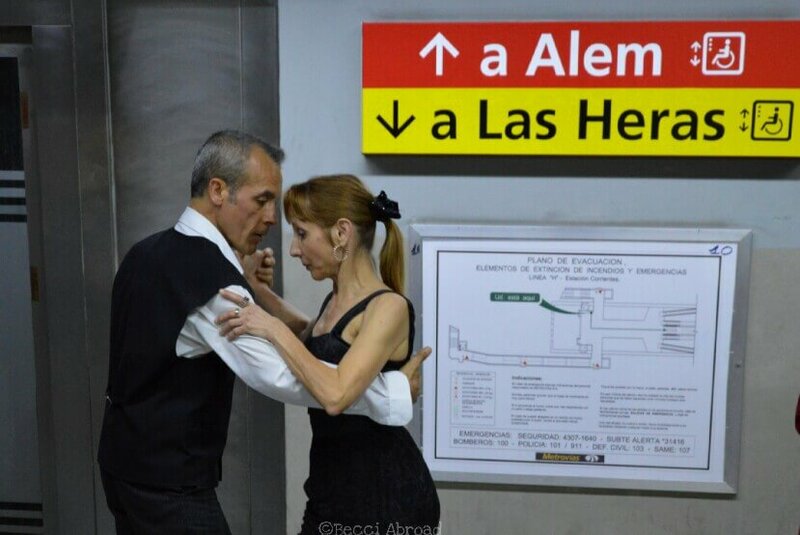 What does tango have to do with Buenos Aires’s subway you might ask? Actually a lot more than you think! 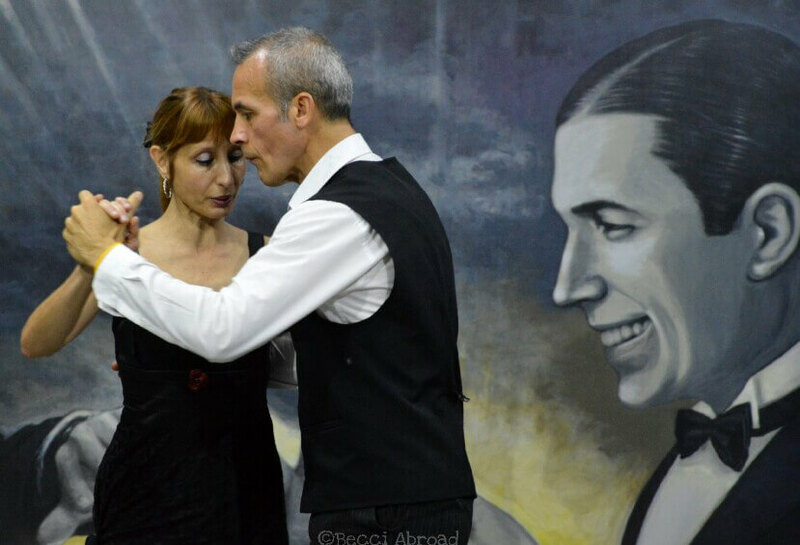 In connection with the annual Buenos Aires’s tango festival, BA tours offered a special edition of one of their tango walks with the promise of a show in the end of the tour… How could I not, not want to see that!? It turned out that it was not a normal walking tour. 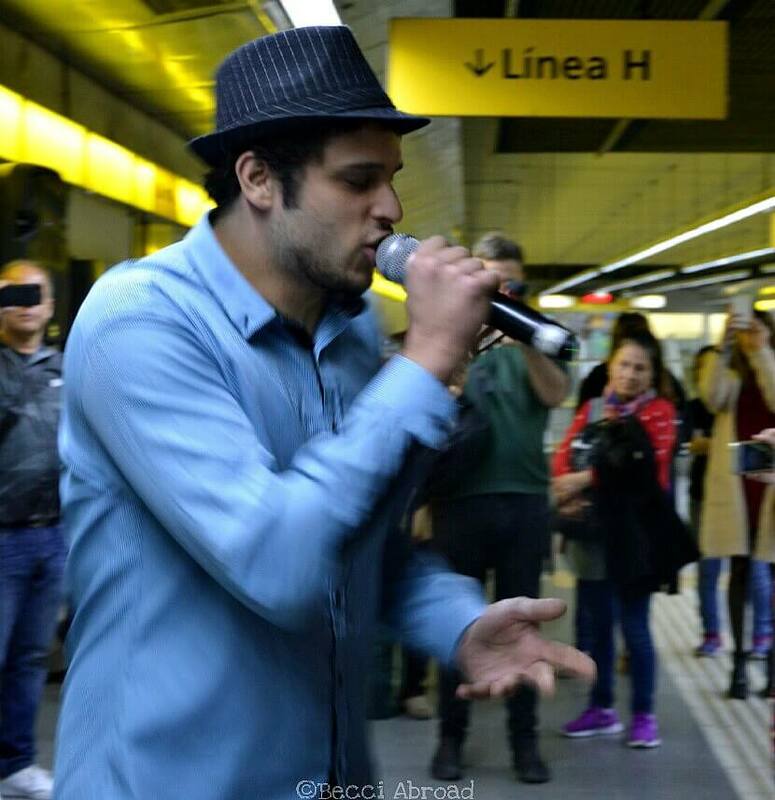 Not only were there more than just one tango show by highly professional performers, the whole guided tour took place underground… In Buenos Aires’ subway system! Keep on reading and learn more about tango, Buenos Aires’ subway and how these two quite distinct porteño elements have been merged. I often change subway lines at the station Corrientes which connects the B-line with the H-line, and there you can’t miss the tango references. At Corriente’s station a huge mural of Carlos Gardel and another tango star, Enrique Santos Discépolo, completely covers a wall. 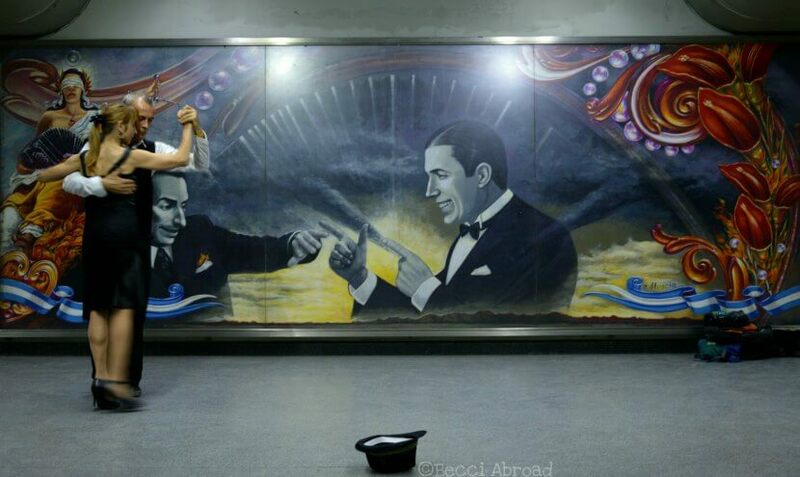 From time to time, there is a couple dancing tango in front of the mural while tango beat fills the station. Thus, it was not before I went on the tour that I realized that every station on the H-line is decorated in memory of different tango personalities. According to the guide from BA tour, none of the big tango stars of a past left any remarkable graves or memorials… Simply because there was nothing left in their bank accounts by the time of their death. They lived the sweet life all the way through. Not even Carlos Gardel – the biggest of them all – left enough money for a memorial. In 2003, the local government of Buenos Aires gave the past-century tango stars a helping hand. They passed a law which indicated that the to-be-established new H-line in the subway system should be created as a “culturally tango tour of the subway”. 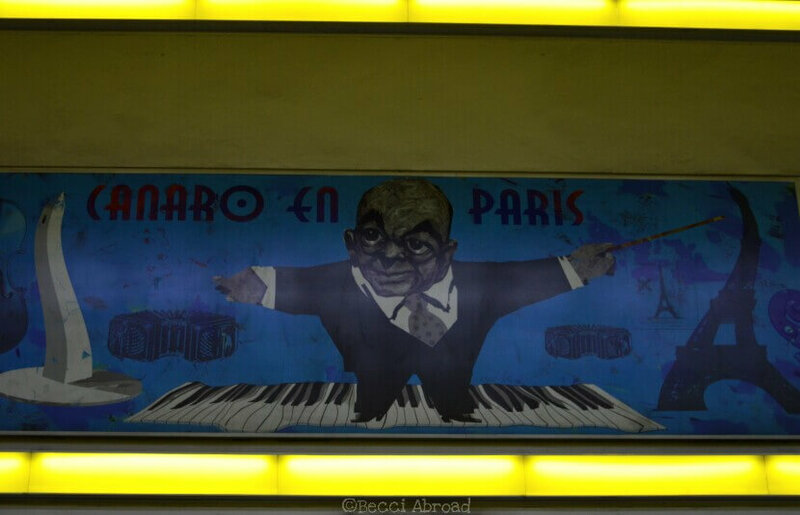 Each station should be decorated with images and art works referring to different personalities within tango. And so it became. Throughout the tour the guide explained and pointed out all the old tangeros decorating the walls of the Subway stations. 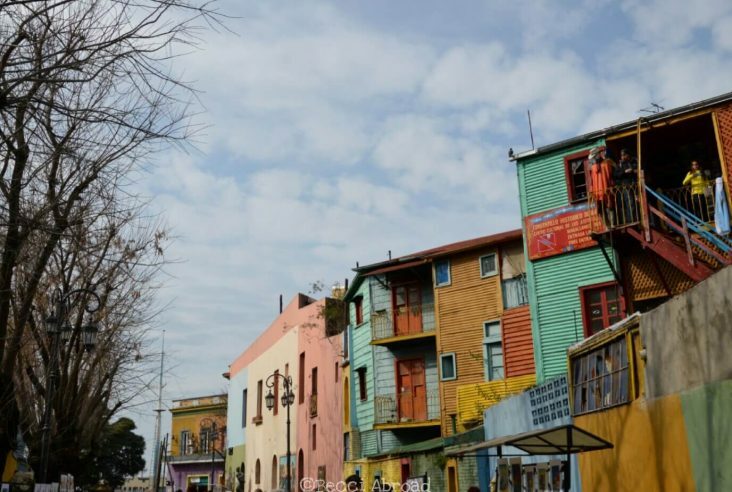 The BA tours are some of the many free activities in Buenos Aires – check out more here! 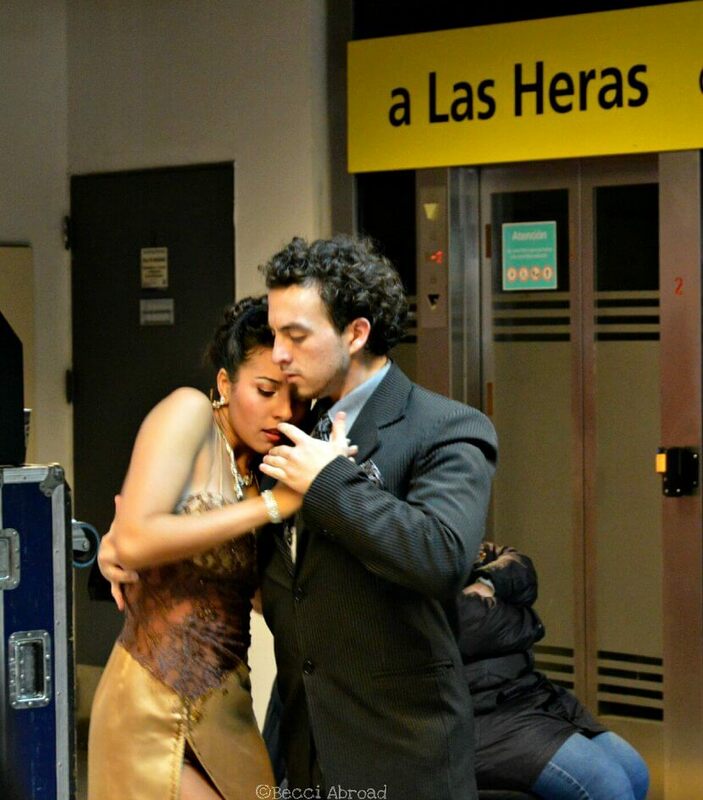 Unfortunately for non-Spanish speakers, BA tours only offers this tango tours in the subway in Spanish. However, they do offer another tango tour in English (link), which I’m still to try out! The H-line of the Subte is the first subway line to be built since the 1960’s. The line eased the connection between the south and north part of Buenos Aires. Furthermore, it connects with all the existing subway lines, and therefore improves the infrastructure for a huge amount of porteños. 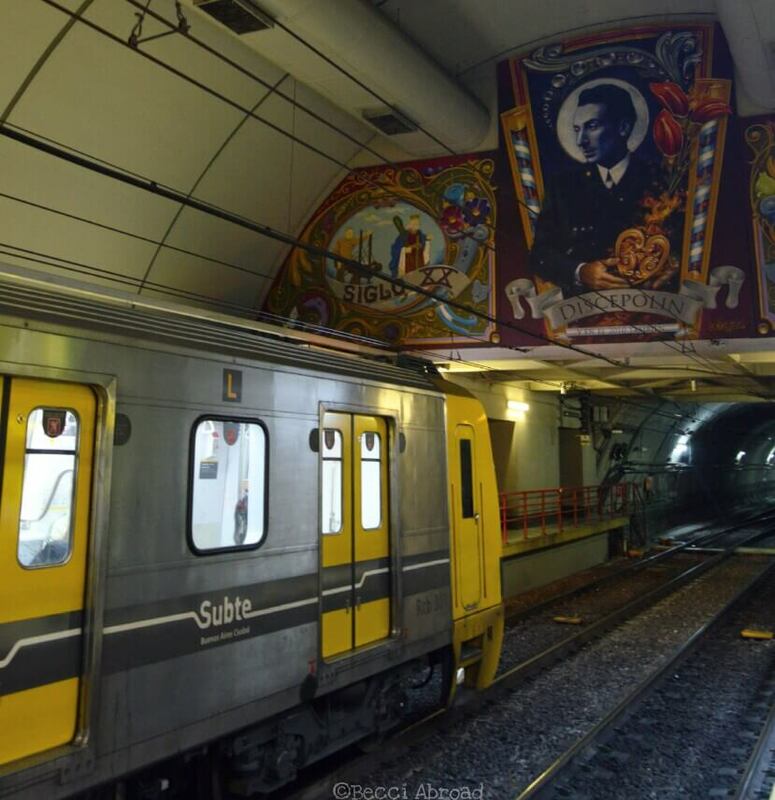 Read more about the Subte, the public transportation in Buenos Aires and how to use it. 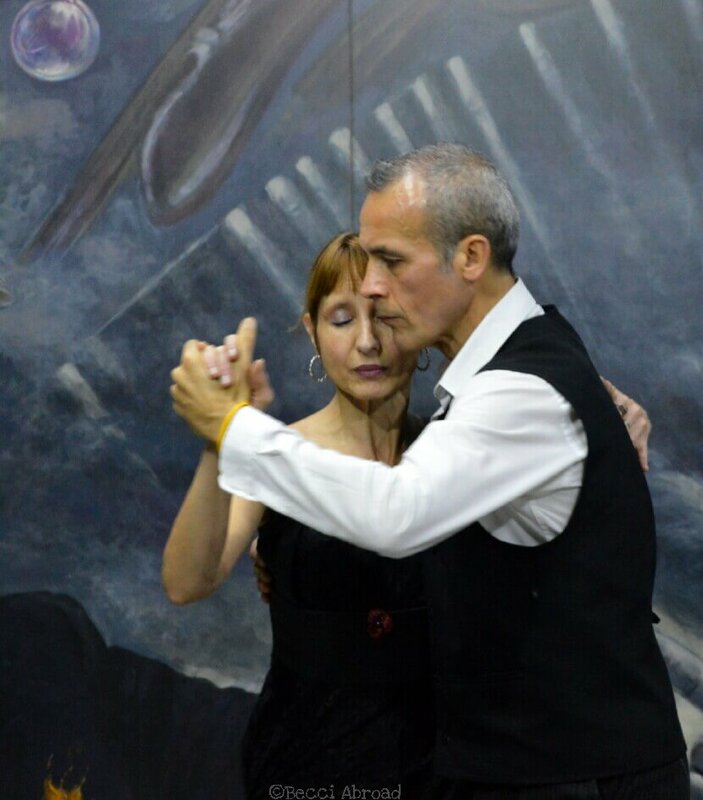 According to some porteños tango has sat its mark on everyday life in Buenos Aires. 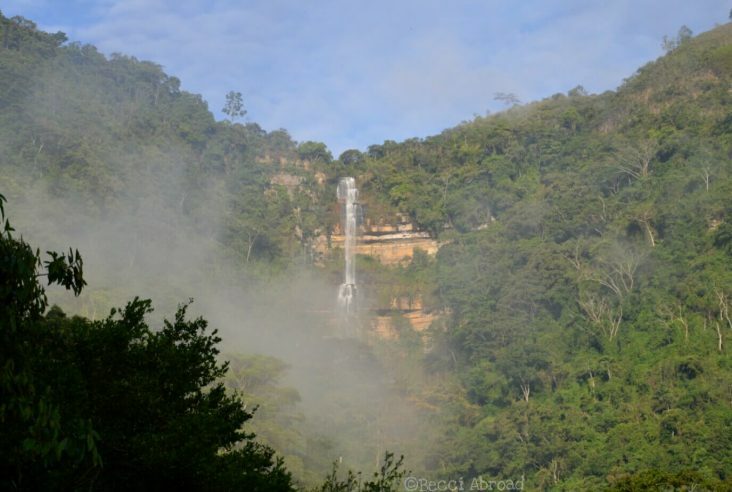 Are the porteños, for example, more nostalgic than others because of the homesick and sad lyrics of the tango? Or, as an Uber driver once told me, does the porteños’ special way of speaking date back to the way the tangeros sang? It is up to you to decide what you believe! However, there is no doubt that tango has been and is part of what has put Buenos Aires and Argentina on the world map! 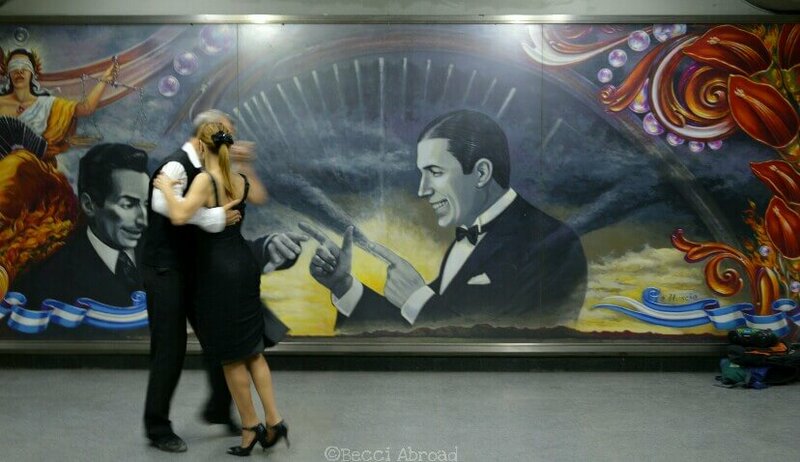 So, Buenos Aires’ subway system has more to do with tango than one would have thought! Have you maybe had a similiar experience elsewhere? Please, feel free to share your thoughts below! I would love to hear from you! Spændende indlæg, Rebecca 🙂 Elsker tango, det er sådan en smuk dans. Tak fordi du tog mig med og sikke lækre billeder 😉 Godt arbejde! Tusind tak for besøget! Glad for at høre, at du syntes om indlægget og billederne! Ja, tango er virkelig en smuk dans! Fik du set videoer også? 😀 (nyeste tiltag på bloggen – og udfordring til mig selv 😉 ). Vi er også begyndt lidt i det små og øver os stadig så måske en dag bliver det godt. What an incredible thing to stumble upon! Argentinians are so much cooler than we’ll ever be. I’ve been to several tango performances in my life, but none quite as fascinating as this one! Thanks for your visit Sierra! So happy to hear that you enjoyed the read! Yeah, they are pretty cool over here! 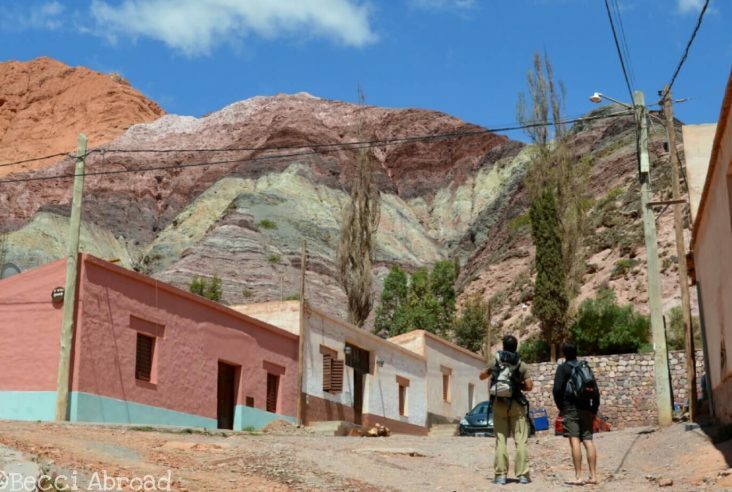 Who else would have thought about making a subway line for tango… Other than the Argentines? ? There’s something fascinating about tango that leaves me in awe each time I have the occasion to see people perform it live. So much emotion going on! I have no idea to dance it, neither have known all the history behind it (thank you for sharing! ), but it’s still impressing to watch it 🙂 How cool they perform it in the subway too! Thanks for the visit, Deea! Yes, tango is truly fascinating and very emotional! For it just adds an extra “touch” when seeing a performance to know the history behind. So impressing to watch! I know of tango but not in such details. Never heard of walking tours in subway before but i find the concept quite interesting. Fascinating! Yeah, it is a funny idea to go walking tours in the subway, right? But actually, there must be a lot of interesting stories to tell in the world’s subways 🙂 Happy to hear that you learned something new about tango! Thank you so much for dropping by the blog! I found the history behind the Tango to be so interesting, I’ve never heard before how it all started. Also, what a cool idea for the tango tours in the subway, I love that!